As the sun broke over the North Carolina mountains that we’re fortunate enough to call home, all of Timberlake knew one thing, that it was going to be a great first full day of 1B. Campers and staff awoke to the sound of Reveille at seven and made their way down to the Tucker Inn, where they were greeted by a delicious breakfast of biscuits, scrambled eggs, bacon, and home fries. Once everyone had chowed down, Timberlake went to the morning yell, and then to Chapel, where today, Timberlake director John M. spoke about who God is. After John had finished, the moment everyone had been waiting before – The Ugliest Camper Contest – began. Now, I know what you’re thinking. Ugliest Camper? Isn’t that kind of cruel? The contest actually awards the title of ‘Ugliest’ to the first year camper with the most paint left on their face from initiation the night before. The contest is just another way we show our tribal pride here at camp, and today, Charles M. was U – G – L – Y (He ain’t got no alibi) as he took home the title for the Iroquois. After the festivities had ended, Timberlake made their way back to the cabins for cabin cleanup. The competition is fierce between the seven cabins, and this session is anyone’s game. Soon the cabins were spotless, and campers went their separate ways for the morning’s activities. Up at the Upper Tower, Garrison B. was busy belaying his fellow campers in climbing, while just across Spencer’s Green, Elliott D. and Samuel S. were excelling at sports with teams in Team Sports. Down at Lake Doris, John C. and Hugh S. began learning the basics of freestyle, already looking like the next Michael Phelps, while at Canoeing, Fox S. practiced steering a canoe. It was soon time for lunch, and Timberlake once again met at the Tucker Inn as a camp. Today, we were treated to meatball subs and fries (My personal favorite meal here at Timberlake). But throughout the whole meal, everyone really wanted to know two things, the winners of Cabin Inspection and Sock War. The cabin inspection announcement came first, and the dining hall was on pins and needles as the oldest and the youngest cabins – Tomahawk and Greybeard – were announced as the two finalists. Today, the men of Tomahawk got the upper hand, earning a perfect 10(!!!!) on the very first day of inspection. Great job guys! For the announcement of evening activity winner, the dining hall was nearly silent. A lot of momentum can hinge on the first night’s activity and when the winner was announced – GO SEMINOLES – the half the dining hall erupted in cheers, while the other half immediately started thinking about their revenge. Next came rest time and then free time, and once that had ended, it was time for the afternoon’s activities. In Pottery, Adam N. really worked on his technique while making a mug, while over at the Cooking Kitchen, Ryan O., Louis F., and Harry D. made some of the most delicious cookies that I’ve ever had. However, the real action of the day happened up at the Archery Range as Owen S. shot the 30 yard targets he needs for his silver bar, while Ugliest Camper Charles M. began working on his bronze bar, all while looking like a natural Robin Hood. During this same time, trips started rolling back into camp after a day out in nature. Carlton W., Jack B., James B., Henry B., Nathan V., Hunter S., and Miles B. got back from their kayaking trip from Section 6 of the French Broad, immediately telling stories from a great day on the river, while Ben C., James K., Mac K., Davis O., and William S., got back from water skiing on Lake James and started talking about all the shredding that they did. Dinner came next, and Timberlake was once again treated to a great meal of pork, potatoes au gratin and caesar salad. 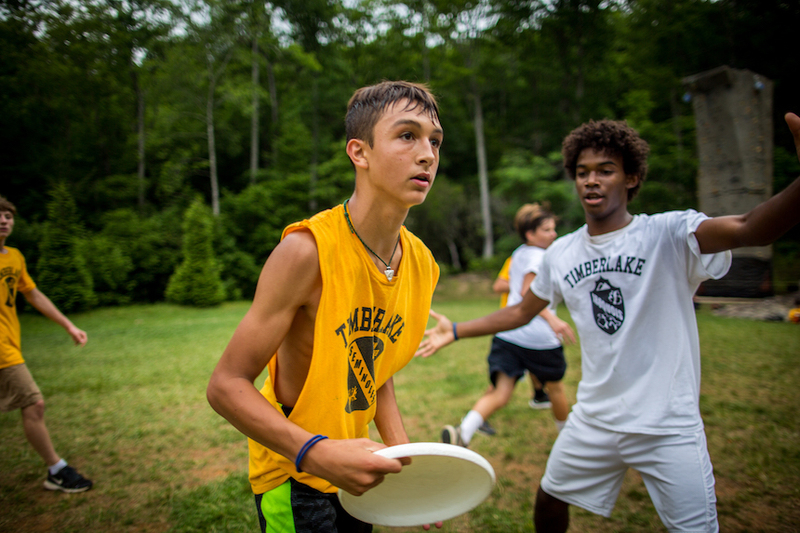 Once the meal had ended, the evening activity was announced, and the dining hall went into a frenzy as the Upper Cabins found out they’d be playing Ultimate Frisbee while the Lower Cabins play Capture the Flag. As I write this now, the two tribes are locked in combat over the banner, as the Seminoles try to increase their lead while the Iroquois try to get back in the race. Who will win? What will happen? Tune in tomorrow for all that and more from another spectacular day at the greatest place in the world.